When Jerome Flewelling started teaching high school physics, he stuck with the “lecture, lab, test” approach he had been taught. Flewelling, the 2018 Indiana Teacher of the Year, soon found his classroom spiraling out of control. Exhausted from his students’ apathy and discipline problems, he considered if he was even cut out for teaching. Instead, he decided to assign his students a project: they had two weeks to build a catapult that would launch a tennis ball across a football field. The project ended up launching something else, too: Flewelling’s new approach to teaching. Constantly reflect on what happened, how it worked, how it didn’t work. Never stop trying to be better, never get complacent in your teaching. Flewelling spoke at the School of Education as part of a presentation sponsored by INSPIRE Living-Learning Center. He now teaches physics at Crown Point High School in Crown Point, Indiana. In his classroom, he says it’s his job to celebrate each student’s uniqueness. 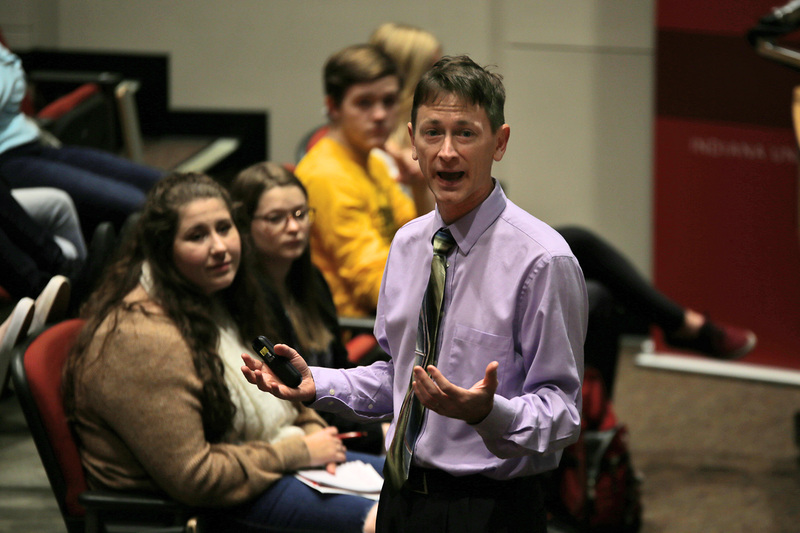 After twenty years of teaching and countless lessons learned, Flewelling still looks for ways to improve his classroom – and advises future teachers to do the same.